When you are competing, you need an edge and having the best tennis shoes to enable you to get around the court effortlessly. We take a look at some of the coolest tennis shoes out there and give you some insight as to how and why they will give you the winning edge when taking on your opponents. When considering which pair of sports shoes to buy, you should consider their weight, the type of material they are made from, the traction they will afford you, and of course the style of shoe that suits your play. Whether you are playing tennis, running or enjoying a spot of golf your shoes should be suitable. If you also cycle, see our top 10 on the best shoes for cycling. Different courts demand different types of grip to enable you to play at your best. Using grass court shoes on clay is not going to give enable you to be competitive, so you need to select the tennis shoe that will help you lift your game. View the Best Shoes for Tennis, Below. How to lace Tennis Shoes? How to Stretch Tennis Shoes? How Should Tennis Shoes fit? How to stop Tennis Shoes from Squeaking? How long do Tennis Shoes last? Whether storming the net, rallying or serving, your shoe can make all the difference to your game. We review some of the best on the market and help you to understand what type of shoe to improve your court performance in the best way possible. Also, enjoy Bowling? You don’t have to use the alley shoes anymore! See our review on Bowling Shoes here. Traction, balance, comfort, and weight are all considerations when looking for the perfect tennis shoe and with New Balance Men’s MC806 Stability you get the best of all worlds. This lace-up shoe will give you exactly what you need to be able to perform at your best on the court every game. Tennis shoes need to protect your feet. When playing you put a lot of pressure on certain parts of your feet. Your toes are one of those areas, and protecting them is important. New Balance has a reinforced, perforated toe box and side panel that protects your toes when you are sliding into a shot, or stopping and turning on a dime to get to the ball. The ABZORB cushioning and C-Cap midsole of the shoe will give you excellent support and comfort in the areas that you need them most. The rubber sole gives you maximum traction to enable you to get around the court effortlessly. The leather and synthetic material is both durable and comfortable and looks great as well. Protect your toes with a reinforced toe box, keep your feet cool, dry and comfortable with leather and synthetic uppers and ABZORB cushioning. 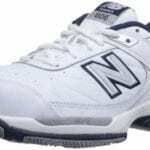 With New Balance you get the traction you need to keep your feet on the court and the lightweight, leather and synthetic upper shoes are durable and look great as well. Lift your game and be ultra-competitive on the court when wearing the Adidas Performance Men’s Adizero Ubersonic tennis shoes. These shoes are designed for the fast game, allowing you to get around the court easily and will keep you stable on your feet no matter if you are playing at the net or rallying from the backline. Sporting a rubber sole that will offer you the best grip possible which allows you to stop and turn in seconds while remaining stable on your feet. The SPRINTFRAME construction is designed to offer speed and stability on the court. ADIWEAR 6 outsole make this a very durable and strong shoe. Lightweight, with EVA midsole which adds cushioning to your midsole keeping your feet comfortable during a long five setter. Toes always tend to take the most punishment when playing tennis and the best of the tennis shoes will always provide extra protection in this area. The Adidas has ADITUFF to give you the protection you need and provides abrasion resistance in this area. The shaft features a low-top inch from arch for ultimate comfort and support during the match. One of the best, most supportive, lightweight and durable tennis shoes on the market and they look cool too. 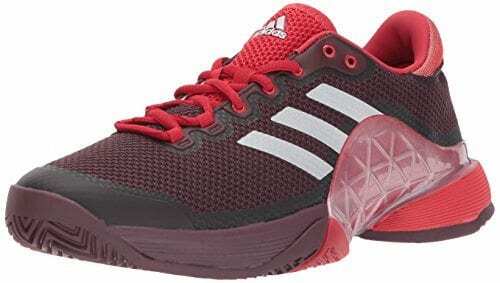 Excellent toe protection and traction the Adidas will lift your performance on court and give you the stability and speed you need to be as competitive as possible. Tennis is a fasts, competitive sport that demands a lot from your feet. You need to be able to move effortlessly and quickly across the court and your feet need protection from the pressures you place on them during the game. The Adidas Barricade Club gives you all of that and more. A rubber sole provides the traction you need to stop and turn instantly and the textile upper is lightweight and supportive of your foot. The shaft of the shoe is low-top inches from the arch. The Torison system provides support and comfort in the midfoot for when lunging for balls and Adiprene cushions your heels and toes as you move around the court. The insole of this tennis shoe is removable and replaceable with your own specialized orthopedic sole for ultimate comfort. The synthetic upper is not only durable but also stylish in design. When you are starting out in the sport, you do not want to spend a fortune on shoes, but you know that these are one of the most important parts of your entire kit. 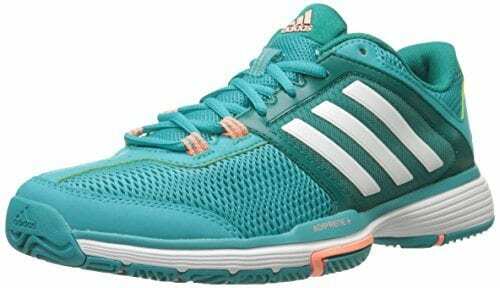 The Adidas Performance Barricade Club is not only well priced but offers everything you need in a tennis shoe to perform on the court. Your feet are guaranteed the best support, comfort and protection with the Adidas when you are speeding around the court during the match. Lightweight synthetic uppers, rubber soles for superb traction and excellent pricing make this tennis shoe one of the best for value on the market. Women play differently from men, they rally a lot more. They need to be able to get around the court quickly, and their feet tend to take a lot of punishment during a long three setter. 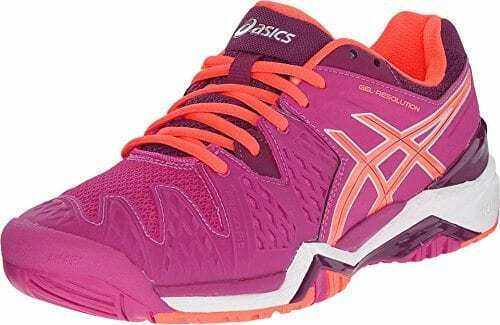 Specifically designed to cater for women tennis players the Asics offers a host of features that include a rubber sole for exceptional traction on the court. FlexionFit with external heel counter, this feature enhances both comfort and support for the midfoot and helps you maintain stability. The shaft of the shoe measures about 2.75 inches from arch to provide extra support to your foot. All tennis players, men and women are prone to injuring their toes when playing. The Pguard toe protector on the Asics prevents damage to your toes from the pressures of sharp turns, stops and lunges when playing. The gel cushioning system on the shoe, both in the forefoot and rear foot, offer shock protection as well as additional comfort. Padded tongue and collar add another level of protection, support and comfort. The FluidRide construction of the shoe along with the AHAR+ high-abrasion, non-marking outsole provide not only protection for your foot, but durability to the shoe. The material uppers give the shoe a nice look as well. Designed for the lady tennis player that wants to take their game to the next level. Comfortable and durable with Pguard toe protection and gel cushioning for support and comfort in the rear and front foot areas. 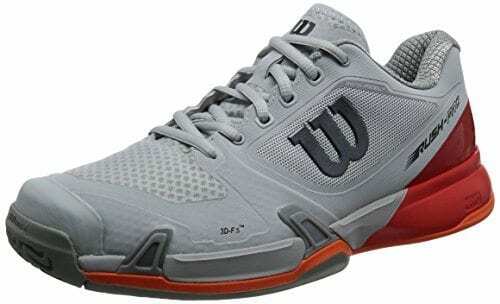 Lightweight and flexible you will be speeding around the court with these great tennis shoes. Adidas has long been well-known for their quality sporting shoes. The Performance Barricade 2019 men’s tennis shoes are another one of their outstanding offerings. Performance, style and comfort come together to give you the edge on the court. The TPU mesh upper skin of the shoe not only offers breathability to allow your foot to remain cool during the game, but it is also lightweight and extremely durable. The rubber sole gives superb grip on the court and the ADITUFF feature that wraps around your forefoot and toes offers protection to the areas that take the most punishment when running around the court. ADRIPRENE in the forefoot area helps you to achieve explosive push-offs and allows you to stop and turn quickly without impacting on your toe and front foot pad. The ADIWEAR feature on this shoe ensures maximum support for your feet and also adds to the durability, look and feel of the shoe. Ultimately if your feet are comfortable you can perform on the court and the Adidas Barricade is up to the task. Comfort, performance and durability are hallmarks of the Adidas Barricade 2017 tennis shoe. Protection for your toes in the ADITUFF feature and a rubber sole to offer superb traction on court. Lightweight, with breathable mesh uppers this is the shoe that will take you to new heights on the court. A ladies shoe that is not only a tennis court, but also an exceptional cross trainer as well. You can wear the Barricade Club lace-up sneaker tennis shoes both on and off the court. First and foremost this is a tennis shoe. The rubber sole offers exceptional grip on any surface, and is perfect for the hard courts. The lightweight mesh uppers and textile lining give the shoe a great look for wearing both on the court during a match or off the court when in training. The shoe is lightweight and easy to move in, your feet are well supported by the ADIWEAR 6 outsole. This outsole also makes the shoe incredibly durable and flexible and, along with the mesh uppers, provides a snug and comfortable fit for your foot keeping them cool and dry. ADIPRENE cushions and protects your heels and along with the forefoot straps offer additional support in the midsoles. For high performance both on the court during the game, or off the court while training the Adidas Performance Women's Barricade Club provides all the style, support and comfort you need. Featuring Adidas’ ADIPRENE, ADIWEAR and rubber soles, you can be sure of quality, excellent cushioning and ultimate support. A men’s shoe that offers you cushioning designed specifically for the male athlete. Men and women have different pressure points and ASICS recognizes that and accounts for it in their Men’s Gel-Resolution 7 .The AHAR material on the outsole of the shoe is wear resistant and durable and the rubber sole offers exceptional traction on the courts, allowing you to push-off, stop and turn in mere seconds. The low external heel counter also adds another level of support. The FlexionFit upper not only provides support with its form fitting qualities but also excellent support for your feet while on or off court. The rear and forefoot GEL cushioning system are shock absorbing and will protect and cushion your heels and midsole. The PGuard Toe Protector is there to take care of your toes, a part of your foot that takes the most pummeling during a game of tennis. Stability, comfort, protection and support is what you get with the ASICS Men's Gel-Resolution 7 and you get a six-month outsole warranty with this great shoe. ASICS has come out with a brilliant product in the Men's Gel-Resolution 7 which is specifically designed to cater for the male tennis player. AHAR outsole, PGuard toe protection and rear and forefoot GEL cushioning provide support, protection and comfort enabling you to concentrate on your game and not your feet. 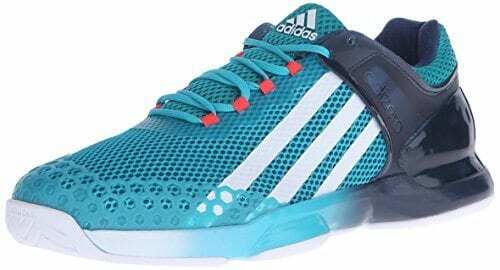 Adidas does it again with the Men’s Barricade 2019 , designed with male tennis players in mind it has all the right protection for the right areas of your foot to allow you to play at your best. A rubber sole provides superior traction on the court allowing you to stop, turn and push-off with ease. The shaft measures about low-top from the arch to ensure you get maximum support and comfort out of your shoe. This coupled with the removable insole, which can be replaced with your own orthopedic insole, makes it one of the most comfortable tennis shoes on the market. Full-length ADRIPRENE+ cushioning, bootee construction and Geofit design, ensure that the shoe holds your foot snugly, keeping it secure and comfortable no matter how hard you play. The textile and synthetic upper is not only breathable and durable, it also lends a touch of style to the shoe. Adidas does not disappoint with the Performance Men's Barricade 2017. Designed for male tennis players it offers a Geofit design with Bootee construciton, replaceable insoles and excellent traction. These are some of the best men’s tennis shoes on the market and you will see the difference in your game. 3D-F.S technology sets this shoe apart, it offers flexibility, breathability and stability, three of the most important aspects of a shoe for any tennis player. The Endofit inner lining locks the foot in place to ensure that you get no slippage as you push-off aggressively or when serving. The R-DST+ technology ensures superb comfort with exceptional cushioning and responsiveness that you need from your shoe. The Pro Torque Chassis Midfoot Shank allows you to stop, turn and push-off easily and the traction you get from the Duralast rubber outsole with herringbone tread pattern is exceptional. Lightweight so that there is no drag added to your feet, especially when serving. The padded tongue and collar keep your feet snuggly settled in the shoe and cushions the bridge of your foot. 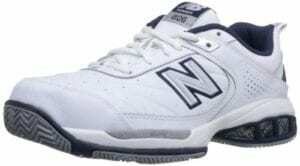 Add to all these features great looks and a lot of flexibility and you get one of the best of the tennis shoes on the market for men in 2019. For the man who is looking to up their game and take it to the next level the Wilson Men’s Rush Pro 2.5 tennis shoe will help you get there. Great traction allows you to move effortlessly around the court, combined with flexibility and stability, you could not ask for a better shoe on the courts. Double Russel mesh uppers make this one of the lightest shoes around and the breathable PU leather makes it one of the most durable on the market. Comfort, style, performance and protection are the hallmarks of this great tennis shoe. Guard Durable Skin ensures that your shoe does not loose its shape and prevents your feet from slipping in the shoe. The midsole has a three layer power cushioning system to allow the shoe to move with your foot providing the stability and comfort you need. The shoe will absorb the shock load when stopping, turning and pushing-off during the game. The EVA midsole adds another layer of comfort to your shoe. ToughBrid Light Engineering is what makes this shoe so lightweight and durable. Molecular alignment provides for great response from the shoe when you move and it will retain its shape no matter how much punishment it takes. A rubber outsole with rounded sole that offers stabilizing technology round out this great shoe and it wills serve you well on any tennis court you chose to play on. 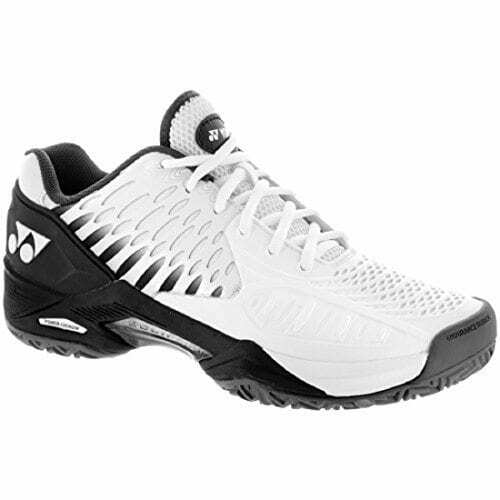 Yonex have produced an exception shoe for the male tennis player. Offering outstanding traction, exceptional comfort and support and superior flexibility, the Men`s Power Cushion Eclipsion is one of the most lightweight shoes on the market and will not weigh you down when you need that extra bit of speed. The Kevlar Fiber upper on this exceptional shoe offers a sturdy frame and great durability. 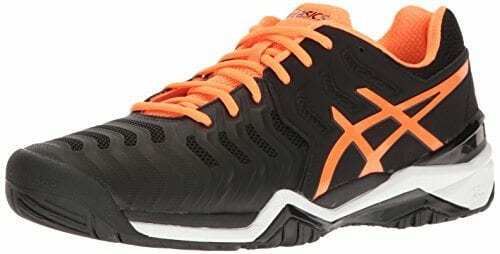 This is an incredibly lightweight shoe that will not weigh you down on court and is built to allow you to move quickly and easily around the court. MatrYX technology consist of high-tenacity polymide fibre which adds a high abrasion resistance to the shoe and makes it extremely durable. The side 2 side EVA technology in the shoes outsole allows the shoe to move with your foot keeping and providing the stability and support needed for the aggressive player who loves to storm the net. The Active Flexion sole technology and Tri-Fit with shock-absorbing Kompressor System design will give you the edge on the court. The Ortholite memory insole will hold its shape and revert back after a shock, such as when serving. It is good to remember that this shoe is designed to fit a small size foot and you will have to get a half size bigger than your usual shoe size to ensure the perfect fit. A high performance shoe that offers some of the best durability, flexibility and support along with superb traction. Breathable uppers and Ortholite memory shape insole keep your feet cool, dry and extremely comfortable throughout your marathon games. A shoe that will definitely help you lift your game to the next level. 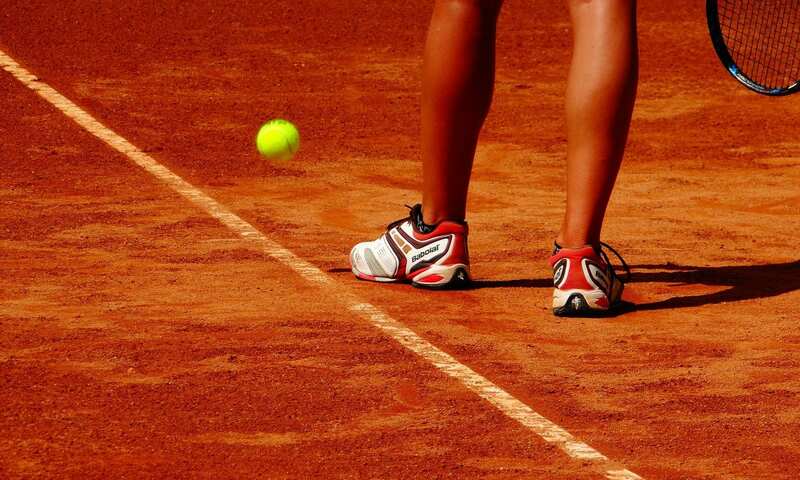 Not all tennis matches are played on the hard courts and having the correct shoe when taking on the challenge of a different surface, such as clay, is vital if you are going to perform at your best. Slipping on clay courts is often one of the stumbling blocks to player, with the New Balance Women’s Clay Court 966 V3 Tennis Shoe you will not experience these problems, the rubber sole and clay court outsole will help you to keep your feet even when you are having to stop, turn and volley at speed. The design of the shoe is specific to clay courts with the Evoknit upper, REVlite Midsole and full-length Ndurance and PROBANK technology. All of these combine to provide you with superior grip on the clay surface, along with superb comfort, even when your foot slides along the surface and of course exceptional support. Mastering the clay court is no easy task but with a shoe that is specifically designed for the hazards and challenges of this type of surface, such as the New Balance, you stand more than a better chance of besting this difficult surface. Clay surfaces bring with them all sorts of new challenges to any tennis player, from pro to novice. Having specialized footwear to help you conquer it is a necessity. Comfort, support and most importantly grip of your shoe is of utmost importance. Specially designed rubber soles of the New Balance are what you need to succeed on this type of surface. Tennis is a fasts sport that demands a lot of your feet. In fact, the game is about 70 percent about footwork, so you cannot afford not to have the best tennis shoe you can afford when walking on court. Toes take the brunt of the punishment when playing tennis so having a shoe that offers protection in this region is recommended, as is one that offers comfort and support to your heels and midsoles. Men and women have different needs when it comes to sports sneakers as their style of play differs greatly (click here for under armour running shoes). A man needs to have a shoe that can absorb the impact of hard servicing and a lot of net play, whereas in general women need a shoe that allows them to get around the court quickly as they tend to have longer rally’s. Both men and women need supportive, comfortable and sneakers that offer exceptional traction in order for them to perform at their best. We look at some of the most frequently asked questions when it comes to sports shoes and answers them for you. If you read this buyers guide combined with our reviews on the best of the tennis shoes for men and women in 2019, you are sure to get just the right shoe for your tennis pleasure. Lacing your shoes is not as simple a question as it may seem at face value. There are a number of different ways to lace your sneakers and the manner in which you do can help to alleviate pain and specific foot problems you may have. There are a few basic rules to follow through. Always lace your shoes starting with the eyelets closest to your toes and then work your way to the tongue. The best and most common method of lacing shoes is the crisscross method. There are a few other methods out there that will help people with specific needs and we run through a few of them here for you. Pull the laces tight to the sides of your sneakers by using the eyelets that are situated the furthest from the tongue of the sneaker, then lace them up, ensuring they remain tight. The wider your feet the more room you will need. Using the eyelets that are the nearest to the tongue of the shoe will give your foot a little more room to move. If you suffer from heel problems it would be best to use all the eyelets on your sneaker and to tie the laces tightly at the top to give the heel a little more support. Stretching any shoe is not difficult. You could take them to a professional but that is an expensive option. One of the easiest and one that usually works with sports sneakers or any shoes is the freezing method. Take a freezer back and fill it about halfway with water. Make sure you remove all the air from the bag and that it is sealed properly. Place the bag in your shoe, pushing it as far forward as possible into the toe region of the shoe. Place the shoe in the freezer and let it freeze. This can take up to eight hours or more. Once frozen, remove the bag from your sneakers and you will have stretched them considerably. If still not stretched enough you can repeat the exercise until you are satisfied with the result. Tennis shoes need to offer your feet complete support and comfort as they work extremely hard during a match. There should be at least 3/8 to a half inch between your big toe and the end of the sneaker for it to be sized properly. The heel needs to be tight and the shoe must not let your foot slip up and down when walking. A lot of shoes tend to squeak and sports sneakers often have this problem. There are a few different solutions you could use to solve this problem. Use baby powder under the insole of your shoe, remember to always wear socks as well. Fix any loose heels or soles on your shoes. Clean and dry the sneakers after use. If your shoes are made of leather, you need to oil them regularly and keep them as clean as possible. Any athletic shoe will last you for about 500 miles or the equivalent of three to six months and tennis shoes are no different. This, of course, depends on how often you use them and how aggressively you play, this makes a difference in the wear and tear of the cushioning of the sneaker and curtails their lifespan. Yes, these shoes are designed to be non-slip. However, this does not mean they will necessarily be non-slip when it comes to walking on wet or oily surfaces. Most athletic shoes, including tennis sneakers, are designed not to slip on the surfaces they are meant to be used on such as tennis courts, including grass and clay courts. Performing at your best on the court is not only about your racquet and balls, it is mostly about your footwork. You need the best tennis shoe you can afford to be able to lift your game to the next level. Comfort, support, flexibility, and stability is what the best rated tennis sneaker will offer you, along with durability and breathable material construction. All of these plus exceptional traction will get you onto the winning path on the courts. 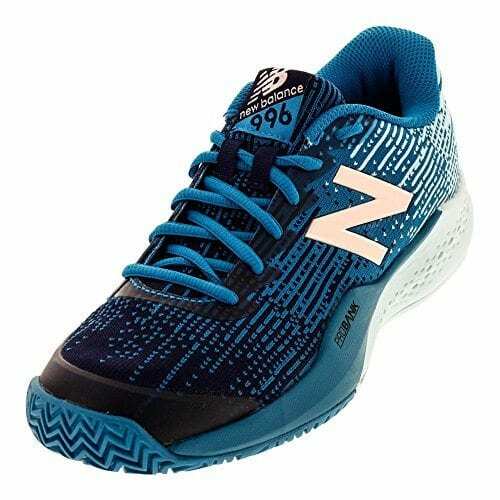 Our best choice for tennis shoes in 2019 is the New Balance Mens MC806 Stability Tennis Shoe and the reasons are obvious. Feature packed and designed to offer you maximum comfort, support, flexibility and durability this is one of the best sports sneakers. The ABZORB cushioning and C-Cap midsole are designed to wrap your feet in comfort and the perforated toe box and side panel will protect your most vulnerable part of your feet in the best way, and the part that takes the most punishment during a game, you toes. The traction on this shoe is prenominal, with a rubber sole that makes stopping, turning and pushing-off easy allowing you to get to that un-gettable ball. These lace-up shoes have a leather and synthetic material upper that is both durable and flexible and will allow your foot to rest comfortably and support it through the five setters that can really take it out of your feet. Aggressive play is the hallmark of a great player and the SPRINTFRAME construction on this shoe ensures that no matter how aggressively you play, you will get the flexibility, speed and support you need to make that unforgettable shot. This is a sneaker that features an EVA midsole that gives you superb cushioning for your front and mid foot and the ADITUFF will wrap your toes and front foot with the best layer of protection and offers superb abrasion resistance. The rubber sole of the shoe offers the best traction on the court surface and allows you to turn in an instant or push-off as you storm the net with minimal delay in movement. ADIWEAR 6 outsole technology and hard-wearing material uppers make this sneaker very durable with a low-top shaft from arch adding exceptional strength and extra comfort to the mix. If you are looking to take your game to the next level and need a shoe that will give you that extra boost you need to get there, then the best Performance Men’s Adizero Ubersonic from Adidas is the shoe you want to be wearing onto the court. 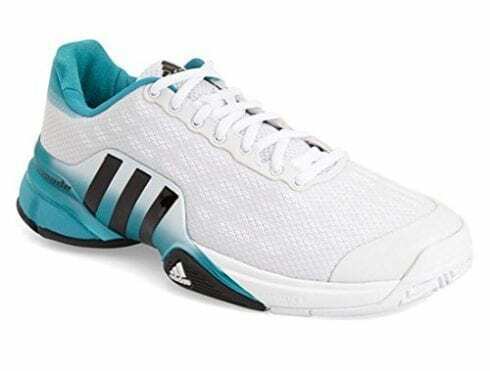 Adidas does it again with this very well priced, Performance Men’s Barricade Club Tennis Shoe which combines style, the best performance and comfort to enable you to reach your potential on the court. Lightweight, durable uppers combine with comfortable and stable soles to give you the ultimate in performance. The Torison system of the shoe offers your midfoot superior support and the ADIPRENE cushions your heels and toes, the two areas of your foot that take the most punishment on court, keeping your feet protected, cool and dry no matter how long the match takes. A lot of players play on many differerent surfaces, some are harder than others – so the footwear you wear can make a huge different – read the study here. A removable and replaceable insole is the cherry on the shoe as it were. 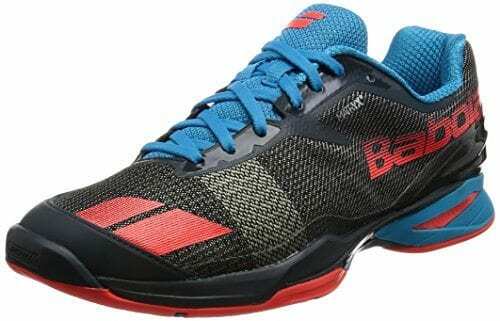 If you are somebody who has foot trouble and needs to use their own orthopedic insole, it is no problem with the Performance Men’s Barricade Club Tennis Sneaker. 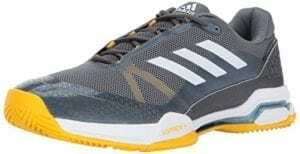 A best performance shoe for a very reasonable price makes this our best value choice of tennis shoes for 2019. Want to know more about Tennis? Read the study here. We hope you enjoyed our article on "The 12 Best Tennis Shoes for the Court in 2019", if so, please share and rate it. I went for the adidas performance barricade, as they were a perfect fit and have great support for when i am on the court.